• Charges EN-EL9 Batteries • Charges EN-EL9 Batteries The Canon CB-2LV Charger has been specially designed to charge the Canon NB-4L Lithium-Ion Battery. 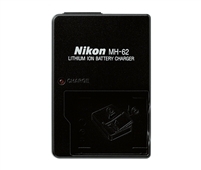 The Canon CB-2LW Compact Battery Charger has been specially designed to charge the Canon NB-2L and NB-2LH Batteries. 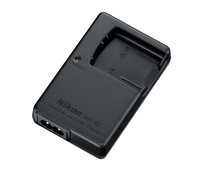 The Canon CB-2LX Compact Battery Charger has been specially designed to charge the Canon NB-5L Battery. 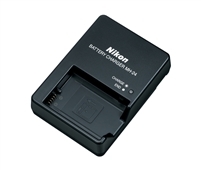 The Canon CB-2LZ Compact Battery Charger has been specially designed to charge the Canon NB-67 Battery. The Canon LC-E5 Battery Charger was designed to charge the LP-E5 battery pack with a charging time of about 120 minutes. 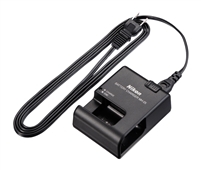 Canon's LC-E8E Battery Charger was decied to charge battery packs for the Canon EOS T2i, T3i, T4i or T5i. The Canon LC-E10 Battery Charger for EOS Rebel T3. 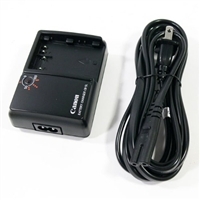 The Canon CB-2LA Battery Charger is a replacement charger for NB-8L Lithium-ion batteries. The Canon CB-2LC Charger enables you to charge and recharge your NB-10L lithium-ion battery pack for your PowerShot SX40 HS and G15 digital cameras. The Canon CB-5L Battery Charger was specially designed to charge the Canon BP-511, 511A, 512, 514, 522 & 535 Batteries packs.